The Saanich Fair, Western Canada’s oldest continuous agricultural fair, is just around the corner and as per tradition, we have three pairs of 3-day gate admission passes to giveaway to three lucky readers. From September 1 – 3, the Saanich Fair will celebrate its 150th year with tons of activities, great music, food, and fun. True to its agrarian roots, the fair will showcase up to 27 types of farm animals, from chickens to alpacas, and everything in between. Headline music includes Chris Buck Band and 54-40. The Chris Buck Band will take to the stage on Saturday, Sept. 1, at 8:00 p.m. for Country Night. 54-40 will perform the second night of the fair on Sunday, Sept. 2, at 8:30 p.m. will perform the second night of the fair on Sunday, Sept. 2, at 8:30 p.m.
Fair admission tickets are available on the Saanich Fair website for $13 or they can be purchased at the gate. Kids and seniors get in for $8. Children under 6 get in for free. Presale midway ride wristbands will be available for $32 while supplies last. They’re available at the Saanich Fair office, open Mon-Fri 9:00 am – 4:00 pm. Regular price is $40 on Saturday and Sunday. On Monday, it drops to $35. 2 – Leave a comment on this page. 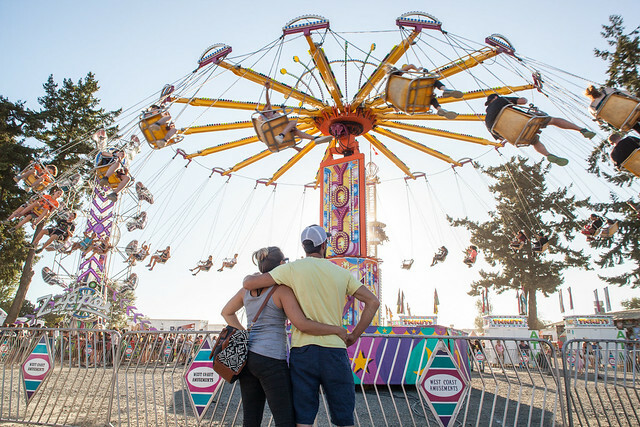 Tell us your favourite Saanich Fair memory or any amusement park memory. 5 – RT the following in twitter. Win a pair of @SaanichFair 3-day passes via @victoriabuzzes http://bit.ly/2nRsxKI l RT to Enter! Contest entries will be accepted from time and date of publishing until 11:59 PST on August 29,2018 . Winners will be contacted through channel they entered.